While visiting Bhangni union parishad of Mithapukur upazila in Rangpur district on March 05, 2014, Ms. Libuse Soukupova, First Secretary, Delegations of the European Union (EU) to Bangladesh and Mr. Simon le Grand, Desk Officer from European Union (EU) Headquarter in Brussels highly appreciated the on-going activities of the Village Courts Project at bringing justice to the doorsteps of the rural people. The visiting envoy had the opportunity to observe an on-going trial session of a Village Court. The EU envoy also had a fruitful meeting with Mr. Ershadul Huq, DDLG Rangpur (Deputy Secretary) and Mr. Harun-ar-Rashid, Upazila Nirbahi Officer of Mithapukur upazila about the on-going activities of the Village Courts Project. They informed EU representatives how people are enjoying access to justice at a low cost and within a short time. The efficient process has substantially reduced case backlog in the higher Courts. Ms. Libuse and Mr. Simon also visited Bhangni union parishad and had discussions with UP chairman Mr. Tazul Islam Sarker, UP members, several panel members of the Village Court and shared views with beneficiaries. The Officer in Charge of Mithapukur Police Station informed the envoy that there has been significant improvement in the overall law and order situation due to availability of judicial services at doorsteps through Village Courts. Later on, EU visitors observed a court yard meeting at Kosbanupur village of the same union and talked to the participants who expressed their satisfaction about the functions of Village Courts in ensuring affordable justice fairly without facing any hassles. Mr. Mohammad Salahuddin Khan, Programme Analyst, Governance Cluster; Mr. Asif Karim, Chief Technical Advisor, UNDP and Mr. Sarder M Asaduzzaman, Project Manager, AVCB project, UNDP accompanied the EU envoy during the visit. 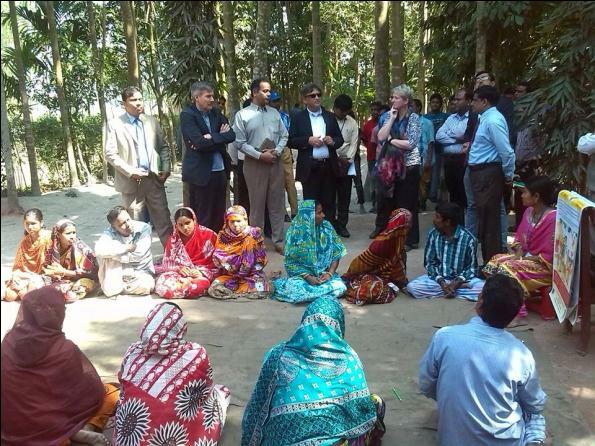 Ms. Libuse Soukupova, First Secretary, Delegations of the European Union (EU) to Bangladesh and Mr. Simon le Grand, Desk Officer from European Union (EU) headquarter in Brussels, visited a Village Court meeting in Rangpur.